A highlight of my summer was a 4-days trip to Paris, just two of us with my husband, strolling in the Parisian streets and visiting exhibitions. But France is first about food, right? So at the top of my agenda was exploring the best gluten free spots of the capital. 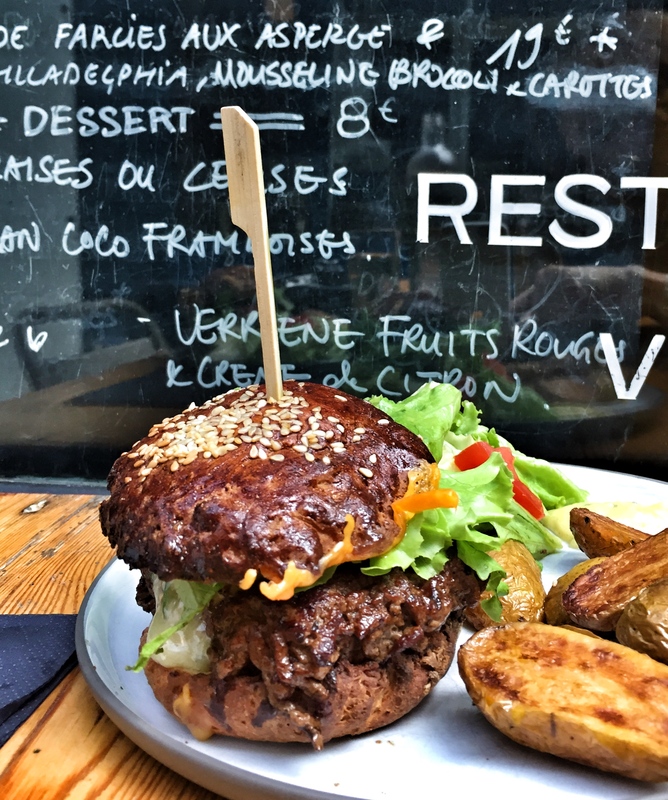 Paris became over the past years a wonderful destination for gluten free eaters, with lovely cafes and restaurants opening all around the city, offering delicious and top quality gluten free food and pastries. Many of them are located in the trendy Marais district, our home base for the whole stay (hint hint!). Follow me on a gluten free tour of Paris! 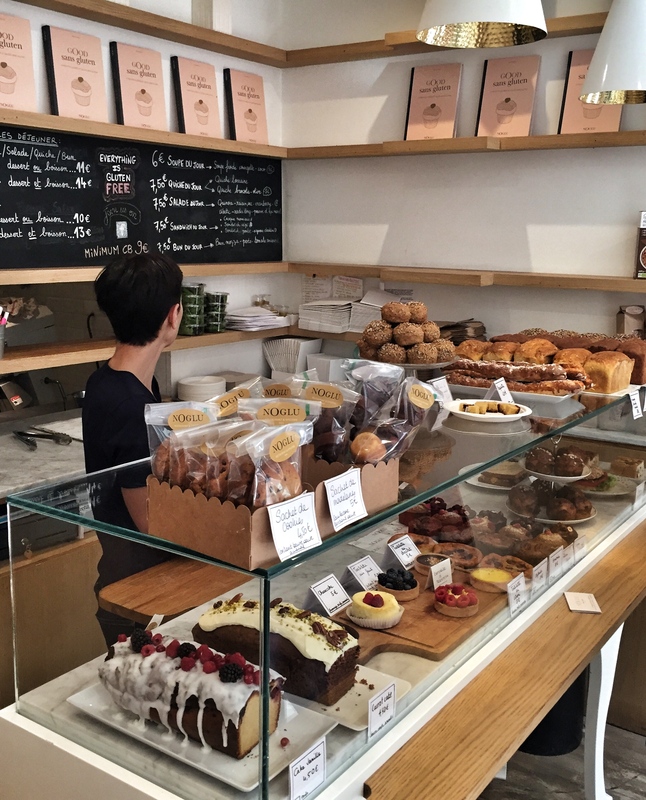 This is THE gluten free boulangerie of Paris. The bakery specializes in rice and buckwheat breads, using 100% organic flours from their own mill in the South of France. 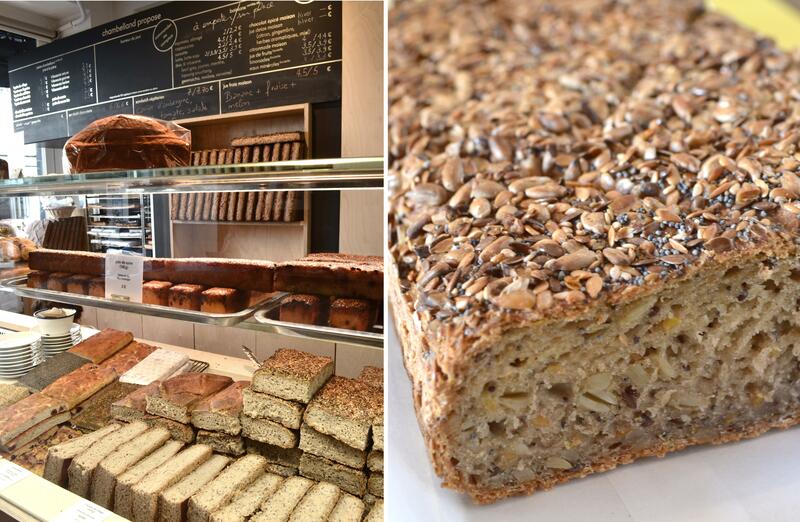 The selection of breads and pastries is wide, with focaccias, pies, brownies, cakes and even chouquettes. There is a small café space in the bakery, with cute Formica tables where you can have breakfast or lunch. I chose a vegetarian sandwich, made of a wonderful focaccia and poppy seeds bread, filled with eggplant caviar, goat cheese and tomatoes. For dessert I picked two pastries: a pain de sucre – a lovely orange blossom sugar loaf – not too sweet at all, and the “Marquise de Popincourt” lemon tart, a classic of Chambelland. The place is cosy and relaxed, with its jazzy background music, and a transparent kitchen where you see the staff preparing breads and sandwiches for the day. 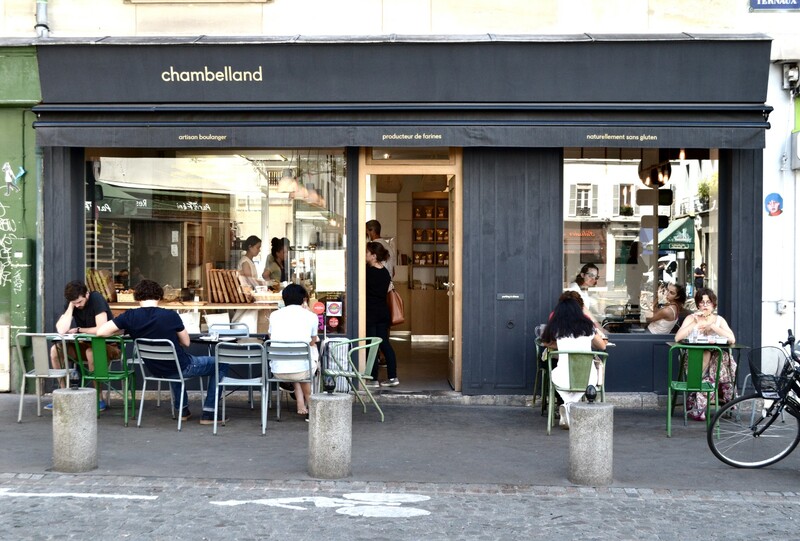 If you are in Paris, make this place top of your list! 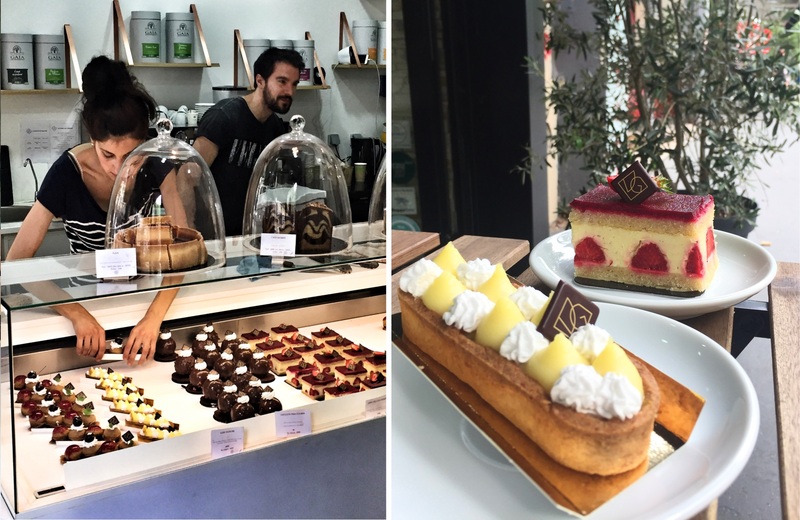 VG Pâtisserie is a vegan pastry shop founded by the talented pastry chef Bérénice Leconte. If you eat vegan (or not!) 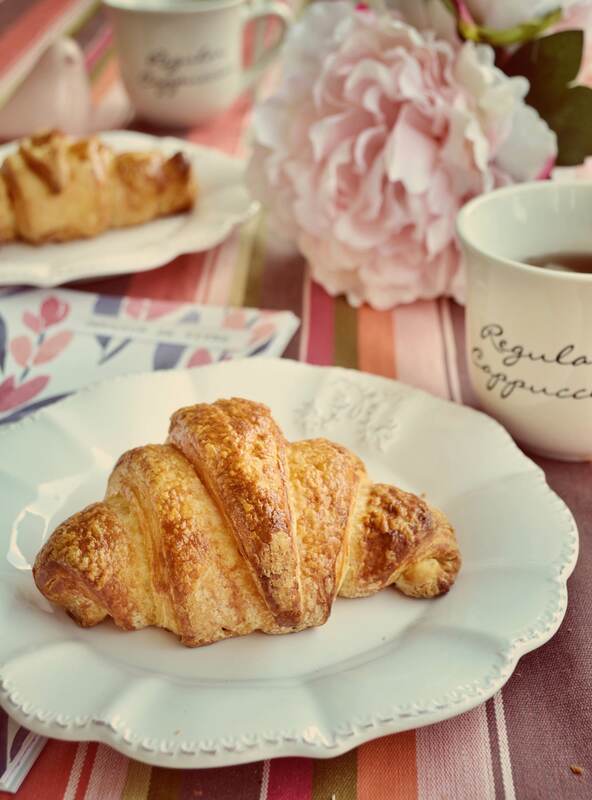 and love French pastries, this place is a must-try! The pastries are so pretty and tasteful. I choose a Fraisier, made of vanilla-infused soja cream and fresh strawberries, as well as a lovely Pina Colada pastry, with pineapple cream and whipped coconut cream – my personal favorite. VG Pâtisserie, 123 Boulevard Voltaire, 75011 Paris. 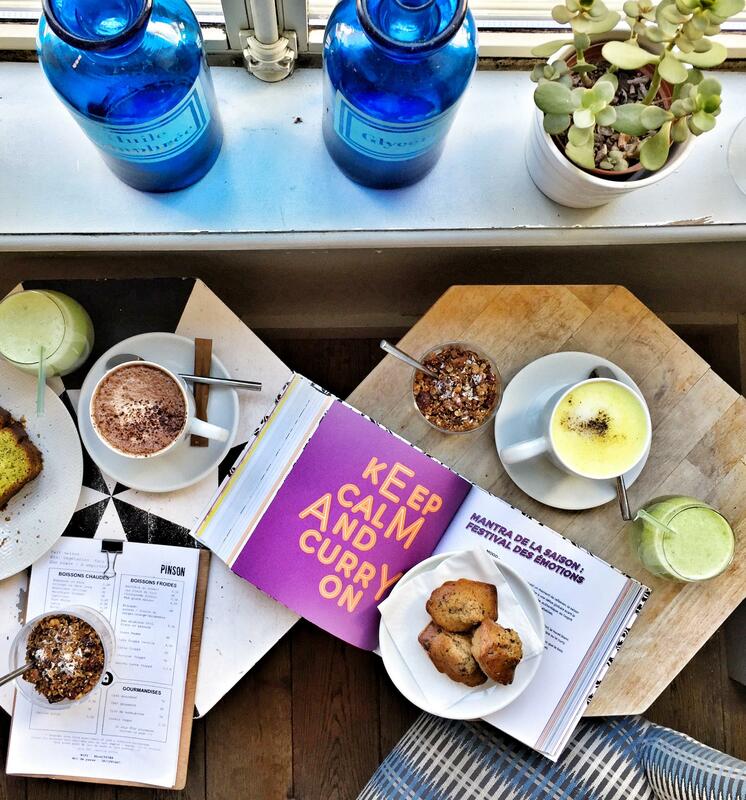 Café Pinson is a trendy café, offering healthy organic food, dairy free and mostly gluten free. There is two location, one of it in Northern Marais. For my breakfast there, I tasted a hot chocolate with hazelnut milk, a delicious crunchy granola with soja yoghurt (their granola is available for sale), a freshly pressed Green detox juice and amaaazing chocolate-hazelnut madeleines. The interior design is worth mentioning. The cafe is luminous and spacious, with beautiful features like rough brick walls, geometrical-patterned tables and flooring, and wicked chairs. 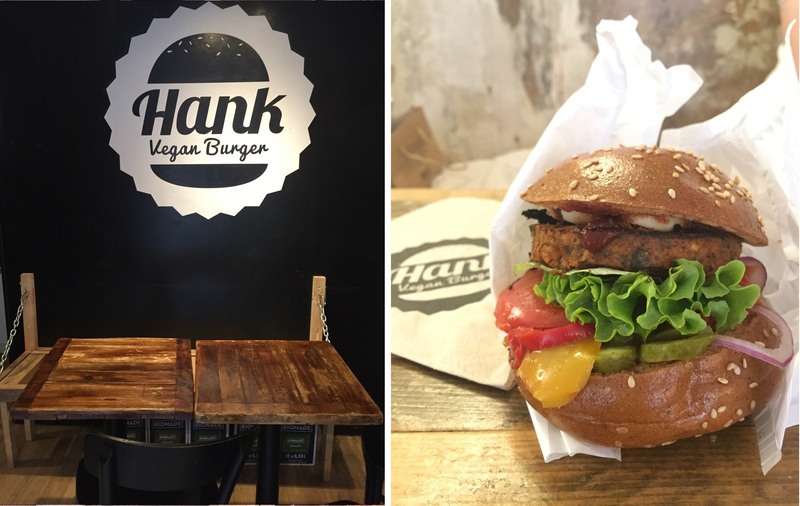 If you crave for a vegan burger, this is the place to go: Hank burger is small and very welcoming vegan burger restaurant, with gluten free options. Great atmosphere, friendly multi-lingual staff, and good value meals including a burger, a side, dessert and a drink. I tested l’Allumé burger, with a smoky flavored sauce, marinated paprika and a coleslaw side salad. The potato wedges are unfortunately not gluten free. There is another branch nearby that sells pizzas, with gluten options too. 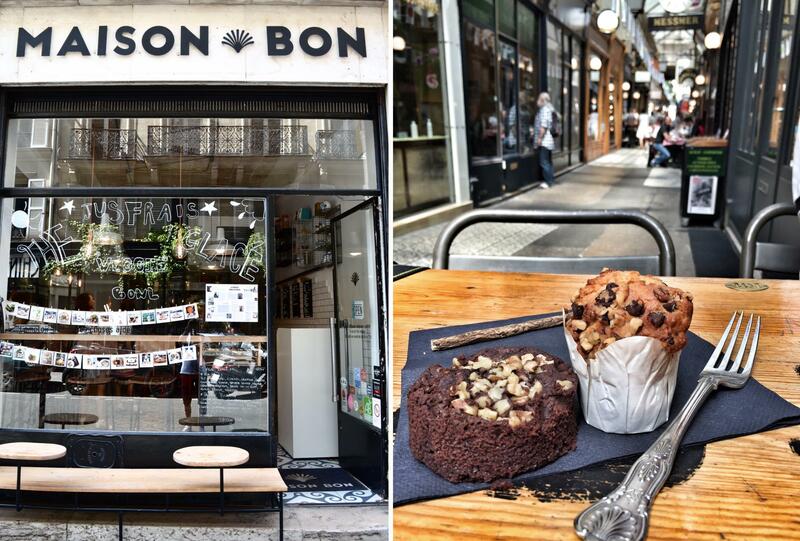 Maison Bon is a vegetarian, organic and gluten free coffee shop in the 10th arrondissement. Veggiebowls, quiche, chia puddings, granolas, cold pressed juices… and a memorable brownie I enjoyed as my afternoon snack. Maison Bon, 11, rue des Petites Écuries, Paris 10e. 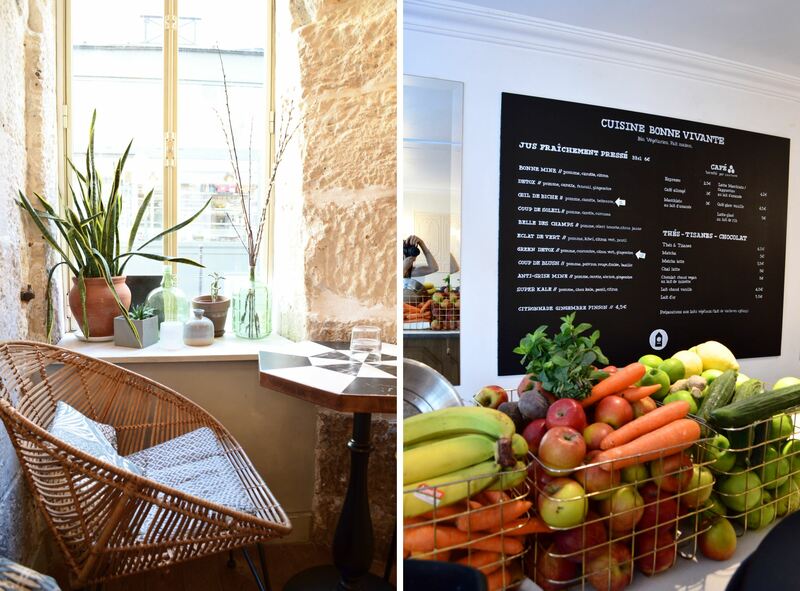 Seasons is an other ‘healthy’ address in the Marais with a concept somewhere between a coffee shop, a bistro restaurant and a juice bar. Not fully gluten free, but with sufficient options to satisfy my wishes. On the menu, acaï or matcha bowls, gluten free baguette with confiture or chocolate spread for breakfast. and sandwiches, salads and cold pressed juices throughout the day. 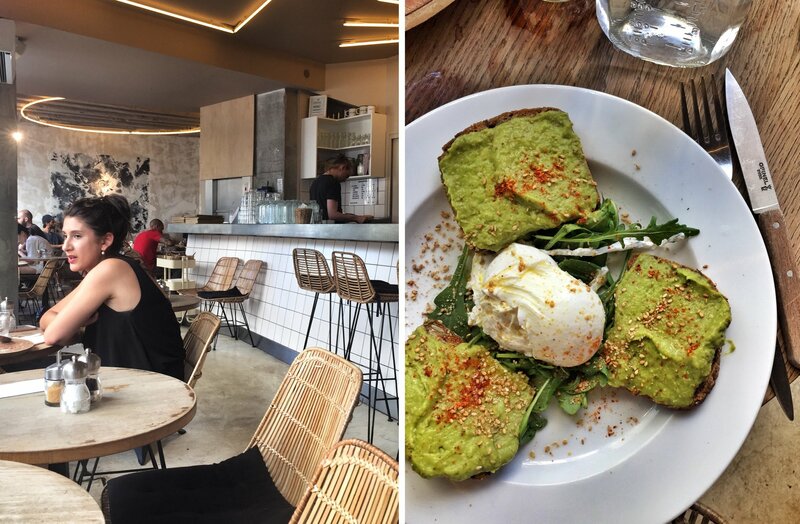 As a light dinner, I ordered the Avocado Tartine, with spicy curry avocado and poached egg on a crusty warm gluten free toast. I had a tasty brownie for dessert. 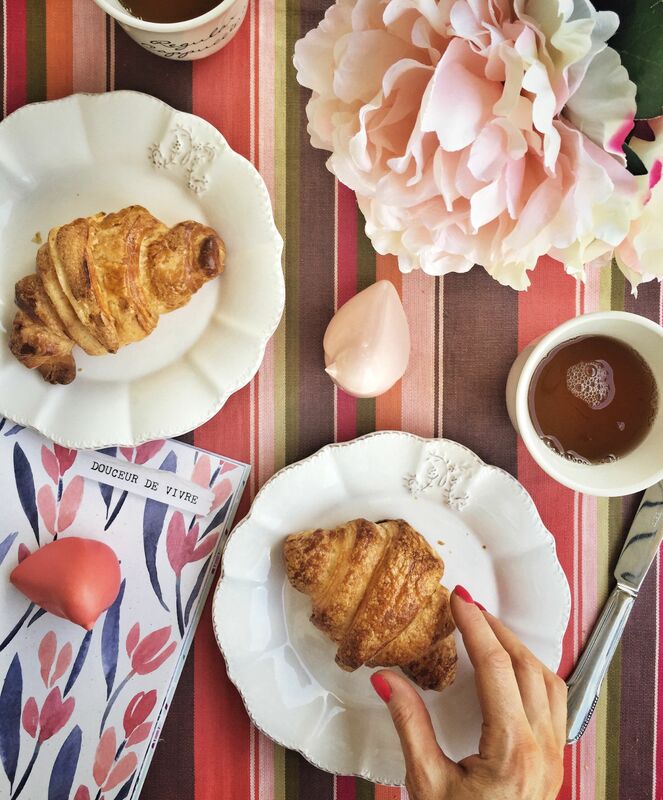 I hoped to have the chance to taste bread or pastries by Eric Kayser, the famous French baker who has stores throughout Paris, with a line of gluten free products. Unfortunately the selection is quite limited and the two shops I visited had run out of gluten free products by the time I popped by. So give it a try rather in the mornings! A few other places I intended to test were closed during our stay in Paris (because it was the week end right after Bastille Day), or we simply run out of time to visit them. Among them is the pastry shop Sitron, Foucade Paris pastry shop and bakery, Fuumi sushi-burrito restaurant (sounds like an intriguing combination, doesn’t it? ), or Wild & The Moon raw, vegan and gluten free coffee shop – just to name a few. I will surely return soon to Paris and explore further the gluten free delicacies our French capital has to offer – I’ll keep this post updated so stay tuned! PS: If you wish to have a guided gluten-free tour of Paris during your stay in the French capital, my friend Chiara from Baci di Dama blog organizes such walking tours. She definitely knows the gluten free scene and will take you to the most inspirational places.